Kate Mulgrew has been acting for 42 years. During that time, she has had several memorable roles, including Kathryn Janeway in Star Trek: Voyager and Mary Ryan in Ryan's Hope. In 2013, however, she started work on Netflix's Orange is the New Black, and found a character she has 'kismet' with: the redoutable, red-haired Russian matriarch of Litchfield Penitentiary, Galina 'Red' Reznikov. 'I've been acting for a long time,' she says authoritatively, 'and I know content by now. I know when the writing is exemplary and when it is extraordinary, and it is both in this case. Mulgrew originally auditioned without reading the full script, but knew right away that there was something special about the show and the character in particular. 'Usually when you have a great role and you play it for a long time the love affair is very fast, as is true in life. If you don't have that instant foundation you don't really have much to work with. 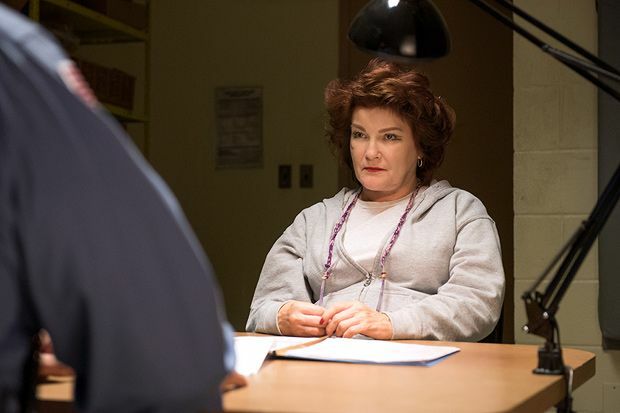 Mulgrew's connection with her character sometimes leaks into the conversation: on more than one occasion, the actress talks as though she is Red, using the first person to discuss what's coming to 'her' in season four (released on Fri 17 Jun). One thing that will not change this season is the value the show places on women's stories. With 50 inmates, and 50 potential stories to tell, Orange is the New Black champions female struggles in an incomparable way. But are women's stories shared enough in film and TV? Arguably, the show is battering away at key issues one-by-one, with everything from abortion to sexuality and gender identity covered through its myriad of characters. This, Mulgrew believes, is due to the excellence of Kohan's writing, and the strength she has as a storyteller. If Orange is the New Black has taught us anything, it's that you'd better do what Red says. Orange is the New Black, Season 4 is avaible on Netflix from Fri 17 Jun.